You can combine the QBot 2 for QUARC with other QBot 2 or QBot (previous generation of Quanser ground robots based on iRobot platform) units, QBall 2 and QBall-X4 unmanned aerial vehicles, or third-party autonomous vehicles, and build an open-architecture, multi-purpose, multi-agent platform for research. Such a platform will allow you to explore areas including collaborative control, adaptive control, fault-tolerant control, sensor fusion, fleet maintenance and more, working in an indoor lab environment. 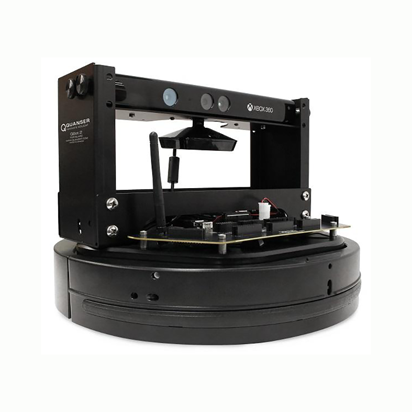 The Unmanned Vehicle Systems (UVS) Lab from Quanser provides a turn-key, integrated environment for implementing UVS controllers and algorithms without having to integrate disparate hardware and software resources. QBall 2 unmanned aerial vehicle(s), and the OptiTrack™ localization and tracking system. The QBot 2 for QUARC incorporates the Kobuki platform from Yujin Robot, the Microsoft Kinect vision system and the Quanser wireless embedded target computer. The Kobuki platform is driven by two differential drive wheels with built-in encoders. The platform includes a bumper sensor, built-in gyroscope and cliff sensors. The embedded computer target can access data from these sensors. The QBot 2 is powered by Lithium ion battery pack ensuring up to 3 hours of operation on a full charge. The embedded target computer mounted on the platform uses the Gumstix DuoVero small-scale embedded computer to run QUARC, Quanser’s real-time control software, and interfaces with the QBot 2 data acquisition card (DAQ). The QBot 2 DAQ integrates the DuoVero computer, the Kobuki platform and the Kinect sensor. Users can customize the platform for their needs by adding off-the-shelf sensors supported by QUARC, including digital (SPI, UART, I²C) and analog sensors. The Kinect vision system is an integrated RGB camera and depth sensor capable of capturing RGB image data and 11-bit depth data at several resolutions and framerates. The Kinect is mounted on a structure that allows users to orient it horizontally or tilt it downwards for various viewing positions. The QBot 2 is accessible through three blocksets that allow user to drive the vehicle, read from sensors and write to outputs, and access the RGB and depth image data from the Kinect sensor. The controllers are developed in Simulink® with QUARC on the host computer. The models are cross-compiled and downloaded to the target computer seamlessly through a wireless router (included in the system). QBot 2 for QUARC comes with Quanser-developed resources, including setup guide, user manual, laboratory exercises and pre-designed controllers. The courseware covers standard topics of undergraduate and graduate robotics and mechatronics courses, such as differential and inverse kinematics, odometric and probabilistic map-based localization, path planning, mapping and vision-guided control.